Form AND Function – Adding an aftermarket rear bumper from Aluminess gives your rig rugged good looks and increases its off-road capabilities. 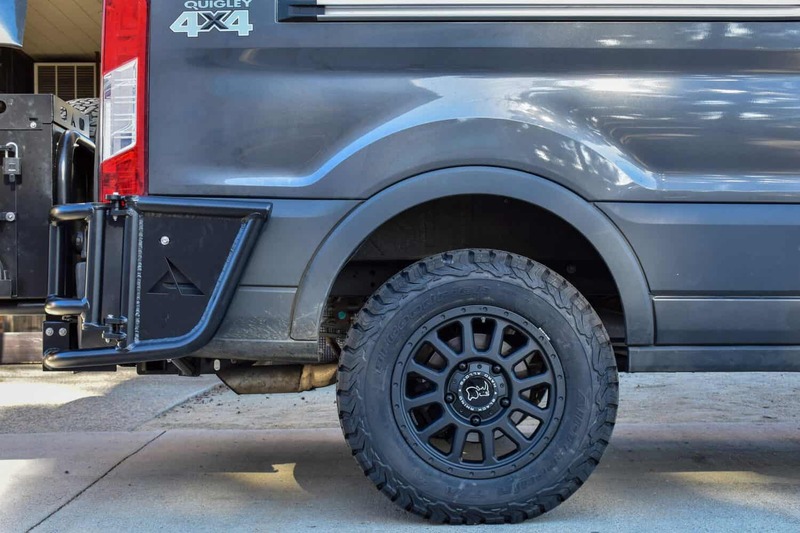 Spare tires, boxes, bikes, and more can be mounted on heavy-duty swingarm mounts freeing up valuable storage space underneath & inside your Ford Transit. Other manufacturers force you to pay a stiff weight penalty to enjoy these benefits which have adverse effects on your vehicle’s handling dynamics and increase the rate of wear on all of your components. Aluminess aluminum bumpers are stronger & lighter than their steel counterparts and resist corrosion. **Sensors holes can be drilled into the bumper by request. On rear bumpers with swing arms the sensors read the box and tire, then will continually beep.